Holding the #1 position on the Billboards Rock Charts is the new Avenged Sevenfold album Hail to the King. This album marks a new chapter in the band’s music as it is the first to have their new permanent drummer Arin Ilejay, who replaced deceased drummer, Jimmy “The Rev” Sullivan. The album has a traditional metal rock ‘n’ roll style that made the band famous, however there are some songs featured on this album that have a much softer, more solemn tone, like the song “Crimson Day.” Hail to the King opens with the song “Shepherd of Fire,” which has a traditional metal tone reminiscent of Led Zeppelin, while still sounding fresh as the musicians include the use of war drums and a fog horn-like sound to bring about a heavier feel that is sure to make any rock fan hooked on the album. “Requiem” is a track reminiscent of the original Avenged Sevenfold sound, beginning with a Latin chant the band is known for using. As the song progresses, lead guitarist Synester Gates emphasizes his guitar skills with a solo that would make Eddie van Halen proud. 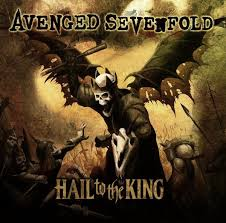 Whether you are an old Avenged fan, or this is your first time listening, Hail to the King will not disappoint. Cant wait for there new album. I found this article offensive. I hate this type of music. I don’t know you but I am from the internet and the internet always has mean stuff to say.